Come to the Red Mouse Bar & Grill for an exciting night of amateur boxing! 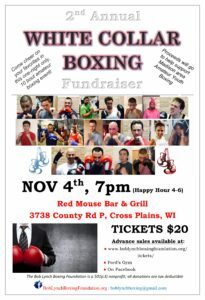 Watch these brave souls step into the ring, most of them for the first time, and put on a show for a good cause: proceeds benefit the Bob Lynch Boxing Foundation’s mission. See promotional videos on the Bob Lynch Boxing Foundation’s YouTube page. It will be a fun and action-packed evening! Fights start at 7PM, and there is a great Happy Hour beforehand. Come for food and drinks, and stay to root on your favorite boxers!